This is one of four flower abstract pieces I will be sharing. 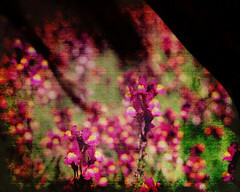 I created these by layering two photos, adding texture and an additional texture layer. All four were created basically the same way using the same texture though different blending might have been used in photoshop. Love the texture that you used for this. The colors are also great.